Shouldn't the title say Apple releases iTunes 12.5.3 with minor changes instead of 12.3.5? I disliked because the version upgrade was to 12.5.3. Member dr. x is correct. The Mac App Store informed me of the 12.5.3 update today. It is still a resource hog and basically a POS piece of software. It used to 'Just Work'. Now? after all the bits that they have removed it does not even work IMHO. Remember Podcasts? Now they don't play in the car on a new iDevice yet and old one that can't be updated and has them as part of iTunes works fine. I don't want Music on my iPad but ITunes seems to think I do. My use case for the iPod and iPad are different yet iTunes thinks you want them to be identical. No I don't and the only solution from Apple was to use separate accounts. Pah. Rant over. Back to Coffee and breakfast. Prompt to download purchased movies is still broken. Clearly you don't know how to use the software. I have no issue keeping music off my iPad and selecting exactly which playlists populate my phone and the iPod I keep in my car. Also, recent updates seem to have cleared up the issues I used to have with Airplay from my computer. Works perfectly now. They keep fixing the playlist order issue, but I doubt they did since it keeps playing tracks out of queue order. Also, some tracks synced onto multiple iDevices are cut off. I’ve checked the original tracks on the Mac and those are complete. It might work fine for some people, but my library has close to 30000 songs taking up over 600GB of space. I think the sheer size of the library makes iTunes behave unpredictably. I regularly check storage for catalog errors—none, & DRAM has been solid. Other programs that take up more resources run as expected. iTunes bug fixes keep failing though. So, I’ve concluded it’s the dev team not stress testing their work under multiple scenarios. So, they don’t see display errors and inconsistent layouts/feedback, etc. until enough people report them. It’s sad the way this software has been neglected. 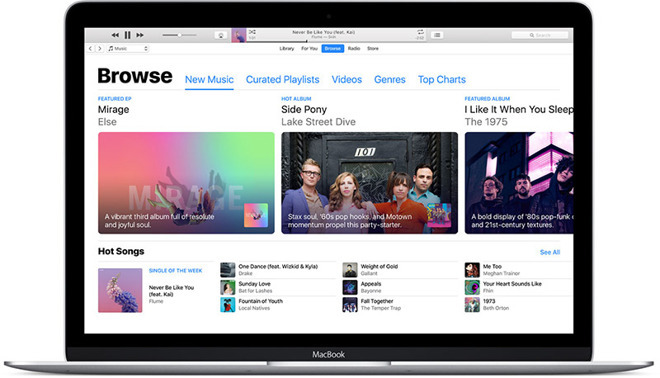 iTunes “updates” to take more clicks to run, and is less a music player each version, and more a “what can you buy on iTMS today?” Sure, it makes more money, but the expense is a burden to UX. I don't have the problems you describe. My library has 210 354 songs taking up 3 TB disk space. It is a bit slow, but it is on a 7 year old iMac, so what can you expect. There are now 3 threads in Apple Support forums regarding this update breaking the ability to add new songs to iCloud / iTunes Match. When adding music, iTunes crashes when connecting to iCloud. I'd hold off on this until a fix is released. This update has killed SRS iWOW plug-in, in fact, all of my plug-ins. Apple have apparently pulled this update. "12.5.3" was showing on my App store updates, but when I clicked "update" it disappeared. iTunes is still 12.5.2.35.